A weakened monsoon monsoon with -26 % rainfall during the week ending Wednesday. Now, as anticipated, with the southern peninsula and adjoining east India posting significant deficit. Bihar recieving heavy rains yesterday. Isolated thundershowers kept the central/northern peninsula wet. Map of actual rain on 12th. And "lo" (pun intented), the axis is dragged down again. As if a "kill joy", a fresh low appeared, and moved inland to reach Maharashtra's eastern end within a day, by Friday.The low, even though only at 1002 mb. is aptly supported aloft by stronger lows, precipitated good rains in its Eastern Quadrant. Remember, this low has clouding in its Eastern Quadrant. This low, weakening,is expected to move north initially, and then a short distances north-west before fizzling out. And, simultaneously, the Eastern "block" of clouds ,will move accordingly. But, the movement will be fast, judging by the current speed, by the time you have read this, it must be over Rajasthan ! Rains will be moving out from North Maharashtra into East Gujarat into South Rajasthan. And the MJO is pushing in a fresh burst of south-westerlies into the west coast from around the 17th. of this month. South-Westerliy winds will bring rain onto the Kerala/Karnataka coast from the 17th. onwards for a couple of days. This rain will move up northwards along the coast, not inland ! Mumbai: Sharp rain showers , between sunny intervals, remind the citizens that the monsoon is not over and done with. In line with the "vagaries" estimate,Wednesday thru Friday, Mumbai had an average of 10-15 mms/day. 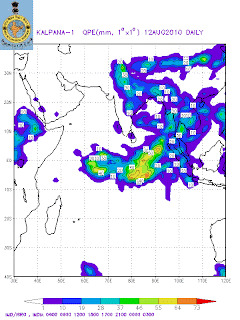 And as stated above, the current low might just by-pass Mumbai of the heaviest rains.I would just about the Weekend forecast to a little increase in rain, maybe to about 25 -30 mms/day. Rain spells were short during the week, may be a bit longer during the weekend. The intensity may increase Monday onwards.The thunder ? Maybe ? 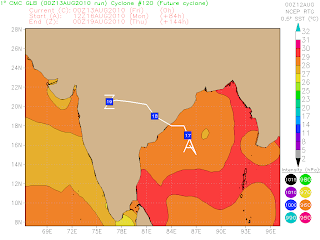 Rajesh, what is the URL where you get this Cyclone ('Low pressures') path prediction like the one you have shown in your current blog and had also shown earlier?